Redmaids’ High School is fast becoming a key venue for music lovers. Not only has it recently hosted a sell-out concert for 500 people to see world-acclaimed violinist Nicola Benedetti in its own Redland Hall, it also now has its own ‘Orchestra in Residence’ in the shape of the popular Bristol Ensemble. The performance on 11 October saw Benedetti play alongside conductor Leonard Elschenbroich, as part of her second trip to Bristol in just over a month having starred at the opening of the new extension at St George’s Bristol. 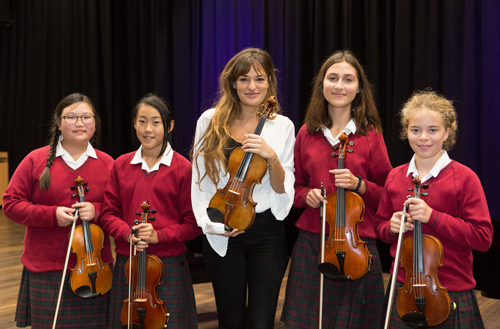 During her visit to Redmaids’ High, organised by the school’s flourishing Music Department, she held a masterclass for a group of its most talented violinists which was also attended by girls and boys from nearby visiting junior schools. At 31, Nicola is one of the most sought-after classical performers of her generation but, down-to-earth and warm in her approach, she addressed the whole school, sharing the values that have helped to place her at the top of her musical game. Aged just four when she herself took up the violin, incredibly she had reached grade 8 by the age of eight. Now, while continuing to perform all around the world, she devotes much of her time to music education and developing young talent.